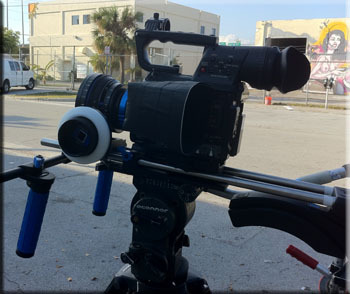 Moving Picture was recently hired to provide a complete production equipment package for Zimmerman Advertising’s ADT Home Security shoot. We sent along a 5-ton grip truck with 1.8K and 4K ARRI HMIs, and a Fisher 11 Dolly. Director/DP Richard Nicolella and Zimmerman Advertising Executive VP Richard Nez lining up a shot. Camera department received one of our ARRI Alexa High-Speed cameras with two of Moving Picture’s new PL Zooms, the Fujinon 19-90mm Cabrio and Canon’s new 30-300mm Cinema zoom. The Fujinon is a wonderful lens. It’s lightweight and compact and has excellent ergonomic features like glow in the dark witness marks and a buttery smooth focus barrel. Zimmerman picked some beautiful homes to use as locations in Fort Lauderdale’s Rio Vista neighborhood, and Mother Nature cooperated with us that day. We look forward to seeing the finished product. Produced by agency EVP and Head of Production Richard Nez, UPM Adam Shilling, Director and DP Richard Nicolella, Camera Assistants Rob Peterson and Josh Baker, Key Grip Todd Smith, Sound Engineer John Zuleta, Locations Glynis Benson.